Delahunt Plant Hire offers clients a clay removal service which repurposes clay as a landfill sealer. After a building site is drained a lot of wet clay can be left over. This nuisance clay can cause issues with vehicle mobility. It can also cause damage to the internal engines of vehicles and building site machinery. The unique service offered by Delahunt Plant Hire, removes the excessive clay after a building site has been drained. This natural clay is then repurposed as a natural sealer for landfills. 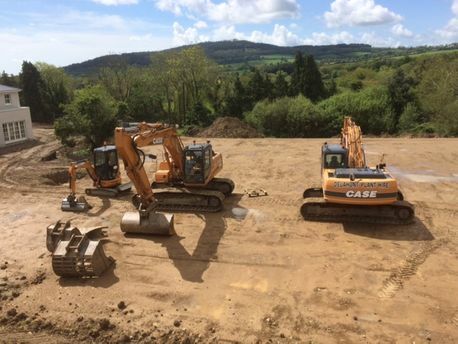 Delahunt Plant Hire is one of the only civil engineering and plant hire companies in Ireland that can offer this convenient and unique service. Is excessive clay causing issues at your recently drained building site? Then get in contact with Delahunt Plant Hire now. Clay is often used in landfills as part of a landfill's composite layer. This is a layer that is laid on a landfill site with the intention of stopping hazardous materials from escaping the landfill and seeping into the surrounding soil or water. A permeable layer – usually a huge plastic tarp – is then placed over the clay. Natural clay, like the clay Delahunt Plant Hire takes from building sites, is an essential component in keeping landfills as safe as possible. Is excessive clay interfering with work at your building site? Get in contact with Delahunt Plant Hire today.